Grindstone Coworking will open its new McAllen office space this month at the intersection of 10th street and Trenton Road at Trenton View Plaza. The location is open to remote workers, freelancers and small business owners in the Rio Grande Valley. Grindstone is now accepting membership applications and pre-leasing for private office suites. It is also offering an Early Bird Special available exclusively to the first 20 members to sign up. “The success we’ve seen with our first location in Edinburg is testament to the growth and acceptance of the coworking culture in the RGV. Gone are the days where you need huge desks, cords and phone lines to work. 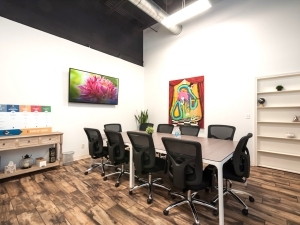 Laptops, tablets and cell phones are now powerful enough to run businesses from, and our location offers a go-to spot to get it all done productively, with a more social environment than the coffee shop or home office,” says Daniel Rivera, founder of Grindstone Coworking. Grindstone Coworking is expanding to the McAllen area to offer additional flexibility for existing members. It is also looking to serve new members located in the McAllen and Mission areas. The new office provides members a communal space to work from along with private office suites for lease. Monthly Grindstone coworking memberships include access to networking mixers and small business education classes. Memberships also include marketing seminars and other events. Since 2015, the company’s location in Edinburg’s downtown area is open to freelancers, remote workers and other professionals. This includes as attorneys and accountants as well as tech professionals and real estate agents. For more information about Grindstone Coworking’s new McAllen location, contact Renee at 956-900-2190, or visit thegrindstone.co/mcallen.